Before describing the steps I took to deobfuscate the malicious script, a word of warning. When you run a Node JS application, you’re no longer running an application in a web browser environment. It is just like any other command line application. Since there are Node modules that can be used to access files on your computer and perform network communications, you may accidentally damage your own files or attack other computers by running the script. So, I always use a virtual machine on a host only network when analyzing the malicious code. Since we’re only interested in deobfuscating the malicious script, there is no need to try to observe what the script will actually do once it has been deobfuscated. The contents of obfuscated.js are shown below. Next, there is a nested function call on line 8 of the script. Since a nested function call is equivalent to multiple function calls on a single line, you may have problems single-stepping through this line in a debugger. The easiest way to unnest the calls is to assign the return value of the inner eval() function to a variable. The variable can then be passed to the second eval() function. The screenshot above shows a multiline script that is now much easier to decipher. We can see an iframe with a URL that contains the word “helloresearcher” being inserted into the document towards the end of the script. The “helloresearcher” string is shown in a pcap at the Malware Analysis Traffic link in the introduction to this post. At this point you should see a debug> prompt, as well as a few lines from the script. Type c to continue executing the script, and execution should pause at the debugger statement. 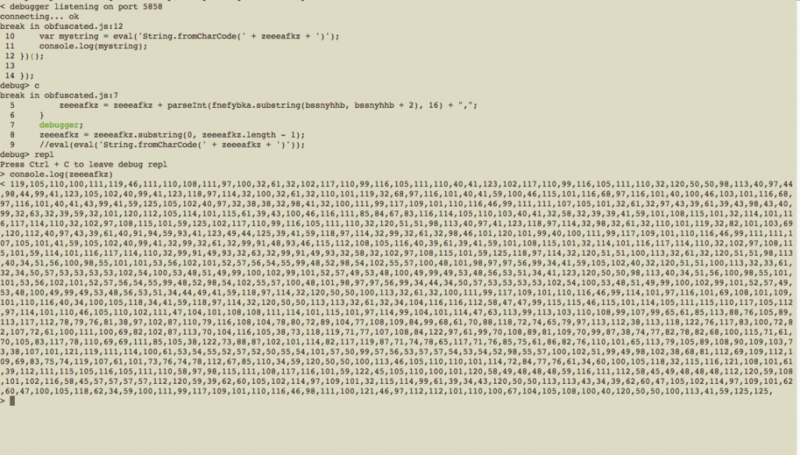 Suppose I’m interested in the value of the zeeeafkz variable at this point in the script. We can use the debugger to display the value. The Node JS debugger is a little odd in that you can step through the script one line at a time by entering commands at the debug prompt. But, you need to open another shell within the debugger to view variables. To open the second shell, type repl. Once we’re in the repl shell, we can use the console.log() function to display the contents of the variable as shown below. The for loop has somehow transformed the lengthy string stored in the variable fnefybka into a string that is now a list of integers. The remainder of the script finishes transforming this data into a string that can be fed to eval(). To exit the repl shell, type Ctrl + C, and you will be returned to the debugger shell. This should return you to the debug prompt, where you can start stepping through the script. Documentation for the Node debugger is available here.